Spyderco Delica 4 Titanium Damascus C11TIPD. The Delica 4 is a sure beauty! Titanium handles and damascus overlay on the blade on front and back. Blade is plain edge and is made of VG-10 steel DPS 15 from Seki-City, Japan. Blade is 2.5 inches and handle is 4.25 inches. Pocket clip is silver and can be changed from tip up to tip down and left to right. Spyderco logo on blade and pocket clip. 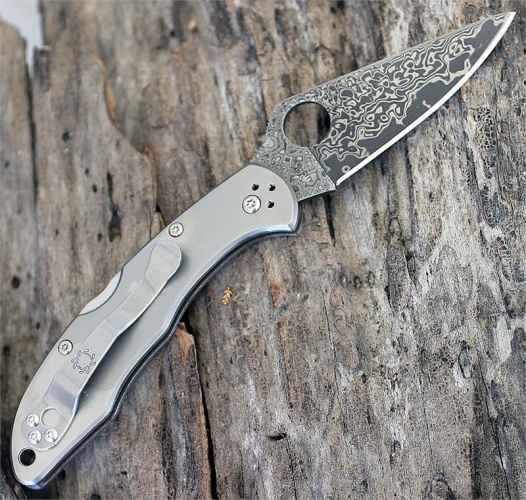 Do you own Spyderco Delica 4 Titanium Damascus C11TIPD? Tell us about it! Have a question? Ask!